The soundtrack of a road trip; a mint leaf in a cup of coffee at Philz; freshly laundered bed sheets; popcorn with brewer's yeast served in a wooden bowl at the Red Vic Cinema (... trust me, people, have I ever lied to you?). And - why not - even the duo mozzarella&anchovie over a cream of zucchini otherwise slightly pale and sadly dietetic: the magic touch that brightens the day, warms up the soup, and saves your face. Slice the onion and peel the garlic cloves. Sauté them in a little bit of olive oil, and then add the zucchini, trimmed and cut into small pieces. Cook for few minutes, then cover with hot vegetable stock and cook for about 10 minutes longer. 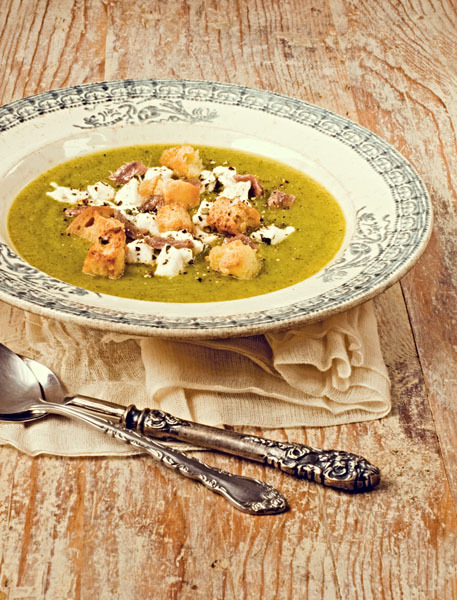 Turn off the heat and puree with a blender until soup gets smooth and without lumps. Season with salt and pepper and let cool down. Meanwhile cut mozzarella into small pieces, dress them with a tablespoon of olive oil and sprinkle with some oregano. Cut the bread slices into cubes, toss them with a little bit of olive oil and toast in the oven for about 10 minutes or until nice and crisp. Serve the soup at room temperature, topping each bowl with diced mozzarella, one anchovy fillet cut into pieces, and few bread croutons. (Recipe courtesy of La Cucina Italiana, ed). Sweet post and lovely & luscious soup!! Yummmm..
how would it be with fewer anchovies and less mozzarella? any substitutions for these? sounds like a fine dish. to mr anonymous of the 7th unit: ypu can skip the anchovie and use tofu if you'd like. not quite the same, but it should work fine. or else, enjoy a no vegan meal once in a while, you deserve it! anything with anchovie make it muy bueno! !